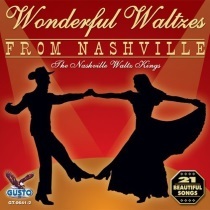 Wonderful Waltzes from Nashville includes some of the finest waltz music you can find anywhere. The Nashville Waltz Kings deliver each song with a down-home flavor you’d expect from Music City USA. These songs are great for relaxing at home, traveling, or just driving through a beautiful countryside. Of course, they are also perfect for waltzing! One glance at the extensive song list and you’ll immediately notice the incredible variety of classic favorites that everyone will enjoy. Some of these songs may seem unlikely for waltz selections, but after hearing them you will understand why they are so well-suited for a collection of songs dedicated to an art form that is fun to do, and beautiful to behold. The term “waltze” is derived from the German word “walzen” which means to roll, turn or glide. There can be no better word to describe the beautifully flowing moves of couples as they gracefully glide across the dance room floor, each matching move for move with their partner. The waltz can actually be traced back to the 17th Century in Vienna, Austria where couples twirled in the luxurious Hapsburg Court. The precursor to those extravagant balls was the more informal setting of peasant villages in Bavaria where the simpler charm of yodel melodies set the tone for couples as they waltzed the cool nights away and warmed the hearts of all onlookers. In the 1800s, the waltz gained popularity in France. The waltz was viewed by some as a threat to the traditional forms of dance, which were more difficult to master. The minuet, for example, required a knowledge of complex steps used in the dance, not to mention the strict body positioning that took more time to learn than did the waltz. The waltz then went through a time of inquisition, so to speak. The stricter “moral” voices of the day supposed that the rapid spins and closer positioning of the partners as they waltzed to be a sinful thing in which to engage or behold. This was particularly true in England where scathing rebukes to waltzing were often issued to the citizens. Ironically, English Queen Victoria was a die-hard fan of the waltz, and she was supposedly one of the finer waltzers of her day! In 1834, the waltz had finally made its way into the United States, beginning in Boston. By the mid-1800s, waltzing was firmly accepted throughout the United States, and it has continued to grow in popularity ever since. Check out this all instrumental CD today!